Among the many things that the American mythology holds to be special about the United States is a particularly strong work ethic. This, of course, is part of a larger narrative of rugged individualism. However dubious the idea of a uniquely American work ethic, it is certainly telling to examine how much Americans work compared with fellow workers in peer countries. 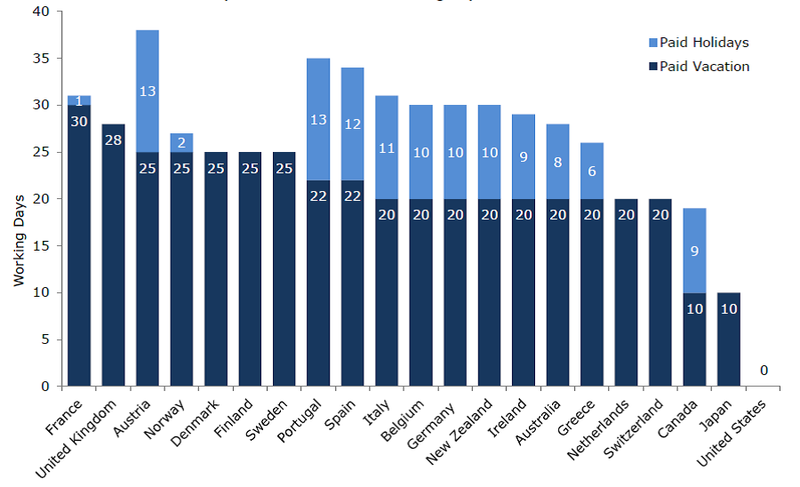 In terms of average annual hours worked per person, the US currently ranks 12th out of 34 OECD countries – that is, Americans work more per year than workers in 22 other OECD countries. 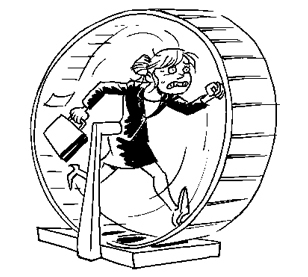 The average Dutch worker clocks in 405 fewer hours per year than the average American worker! Yet, the Netherlands ranks ninth out of the 34 countries in GDP per capita, 15% above the OECD average and just five places behind the US. As economist Juliet Schor argued in a best-selling book over 20 years ago, Americans are overworked. Let us examine the most recent, comparative data in a bit more detail. Source: Author’s calculations, OECD data. Perhaps most notably, the US is the only one of the 34 OECD countries to both have GDP per capita higher than the average – 40% above average – yet also work longer hours per year than the average. Every single one of the other 11 countries with above-average GDP per capita works fewer hours – often far fewer – per year than the OECD average. The starkest difference here is with Norway. GDP per capita in the US is $52k and its average annual hours worked per worker are 1,787. In Norway, the same stats, respectively, are $66k and 1,421. In other words, Norway makes 30% more GDP per person, and yet its workers average 366 hours per year less per year – nine 40-hour work weeks less – than Americans! 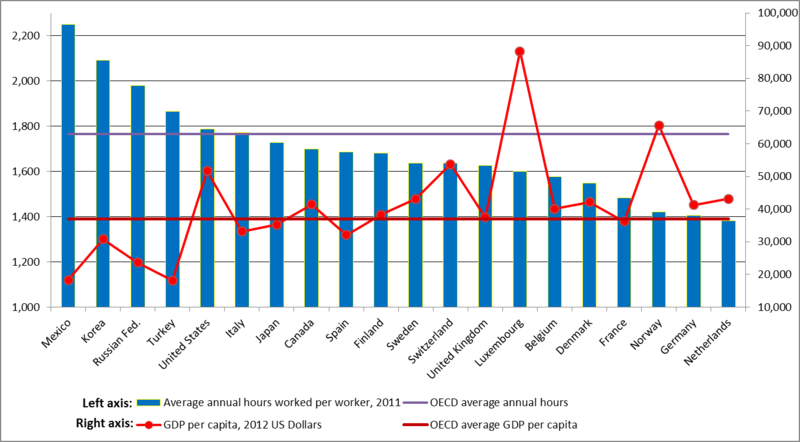 While the Germans and the Dutch don’t quite match the US in GDP per capita, they are both above the OECD average, yet work, respectively, nine and ten 40-hour weeks less per year. What gives? Some of the difference comes down to differences in statutory paid vacation time. As Rebecca Ray, Milla Sanes, and John Schmitt of the excellent Center for Economic Policy and Research have recently shown, “The United States is the only advanced economy in the world that does not guarantee its workers paid vacation.” In contrast, workers in European countries enjoy a minimum of 20 paid vacation days per year, with some countries legally requiring up to 30 paid vacation days per year. And some counties even have legally mandated paid holidays on top of their paid vacation days! Combining legally paid vacation days and paid holidays, Austrians enjoy 38 paid days off from work each year. And lest anyone think their economy has suffered as a result, Austria’s 2012 GDP per capita was fully 19% larger than the OECD average. Source: Ray, Sanes and Schmitt, No-Vacation Nation Revisited, Center for Economic and Policy Research, 2013. While some of the difference in working hours across the OECD countries is proximately explained by mandatory vacation leave laws, a deeper explanation of variations in working time (and vacation leave) would refer historical processes of working class mobilization and welfare state formulation. As the sociologist Gøsta Esping-Andersen found in his classic study of The Three Worlds of Welfare Capitalism, variation in Western welfare state regimes is explained by a combination of the structure of labor unions (hence the nature of working class mobilization) and coalitions between classes and parties. For party development, the key issue is the ability to forge cross-class political coalitions. Esping-Andersen emphasized two aspects of class formation. First, whether farmers joined in coalition with left parties (e.g. in Scandinavia) or with right parties (e.g. in Germany). Second, whether the emerging middle class was incorporated into the left coalition (e.g. Scandinavia) or the right coalition (e.g. the Anglo-Saxon countries). These forces interacted in complex ways over the late 19th and early 20th centuries to produce variation in welfare state regimes and in broader labor market institutions. In the case of the US, with its short history and lack of feudal institutions, it was much more hospitable to the hegemony of individualism and free market ideology than the European countries, even more than the UK which is more similar to the US than the Continent in many ways. Without downplaying the historical complexity that produced these variations, I think it is safe to say that the exceptionalism of the US is explained by a comparatively weak and narrowly focused union movement and the hegemony of free market ideology. Considering the comparative data on working time and vacation leave, the effects of business unionism – not to mention anti-unionism – and free market ideology for the working class as a whole couldn’t be more obvious. Thanks, John. Reach me at matt.vidal@kcl.ac.uk. Look forward to seeing the video.